You may have heard the reports that something called DNSChanger is expected to hit on July 9, but not known what it was or what to do. First, what is a “DNS” and why do you care if it gets changed? First, DNS stands for Domain Name System and it is the directory system that allows computers to locate one another. Your computer has no understanding of a web address such as https://internetuseforseniors.wordpress.com. So, after you type that into your web browser, the computer goes to the DNS and asks for the URL to be translated into something it understands. That something is called an IP address. Like your home address, an IP address is made up on multiple parts. Your home address has a street number, a street, a city, state, country (perhaps) and some code, such as a zipcode. Similarly, the IP address has a series of components that identify a specific computer uniquely. These addresses are of the form 134.124.25.18, where the first number indicates your domain and the last number identifies a specific computer in the domain; the intermediary numbers are further demarcations of the location. Without a DNS server, we would all need to type in the specific IP address. Clearly that is not practical. So, if the malware has infected your computer, then on Monday you will no longer be able to type in a URL and have your computer understand how to direct the browser. To avoid a problem, check your system now. Some services, such as Comcast, has notified the users whose machines seem to be infected. Similarly, Google and Facebook may be posting a warning if they detect your computer is infected. To check, go to http://www.dcwg.org and follow the directions for checking and repairing your machine if necessary. Do it today so you don’t have a problem on Monday! So, what does that mean to you? It means Google just got more useful (and it was already pretty useful!) Google searches should bring you more information of different types. Let me give you an example and then explain the jargon that is being thrown around to explain this idea. Suppose you were interested in “roses.” You would most likely go to Google and search on “roses.” In the past, Google would bring back webpages where the letters “roses” appeared (in that order) or which had descriptions that it had something to do with “roses.” That might mean poems with roses, the War of the Roses, the musical group Guns and Roses, the flower roses, or people who have first names of Roses (probably in error), or other places where the letters “roses” appeared. The term “roses” did not mean anything to Google; the search engine just found places where the letters were used. Now when you type in “roses,” the new and improved Google “understands” that those letters in that order refer to something, a flower. So, in addition to the searches that you might have gotten elsewhere, you will now get a side panel that defines what roses are and how they are classified. You might also get a list of places at which to purchase roses (because that’s what one does to obtain them). It also takes advantage of what other databases Google has that mention roses and what other users have found useful when searching for roses. Why didn’t they just say that Google got better? This is one of those examples where computer people did just say that Google got better, but they did it with a lot of jargon. “Semantic” refers to understood meaning; in this case that the search engine behaves as if it understands the meaning of the string of letters “roses” and its relationship with other things (like stores and gardens and bouquets). It is no longer just finding that word, but is now looking for information about the flower, roses. It is as if you had a librarian there helping you with your search. So, what is all this about the graph? There is no graph on the search page. Again, it is jargon. To computer people, the “graph” refers to relationships among things. So it refers to the way that Google is now connecting its databases and its relationships among pages. It is making those connections to make the searchers more meaningful. 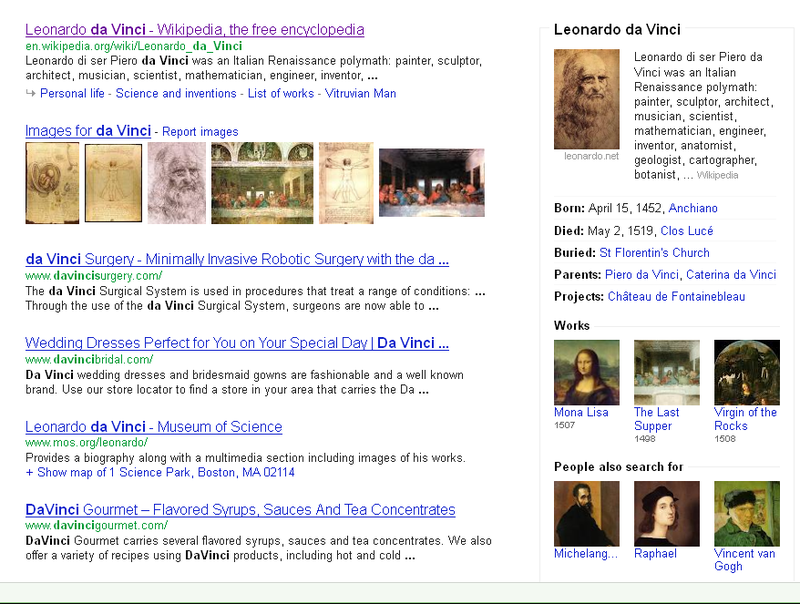 In Google’s announcement, they provided the search example “da Vinci.” This provides a nice example of the new search results. The screen you see is shown below. As you can see from the screen shot above, the left side of the screen provides the typical Google search results. It provides not only information about the artist, but also information about syrups, wedding dresses and surgical procedures that share the name. The part that is different is the information on the right. Since most people who search for da Vinci are looking for the artist, they provide information about him, taken from a variety of databases, for easy access. How well this better informed search will work for you depends on a few things. First, of course, it depends on how similar your searches are to those of other users. The closer you are to “typical” searchers, the more likely you will get this enhanced information. Second, it depends on how well you scope your search. If you are very good and tend to give Google a precise set of search terms, you most likely get to the information very quickly and this will not help much. If, instead, you are terribly general in your search terms, you may or may not get this information. However, if your terms generally provide some boundary, and you are searching for items for which Google has a good network, you will probably find this enhanced search is useful for you. Google can understand that “Paul Gray” is a person’s name and there are two of them. That’s pretty cool! Individual Privacy: Is 1984 finally here? When I was in high school, everyone was required to read the book entitled 1984 by George Orwell. According to Amazon’s description of the book, “In 1984, London is a grim city where Big Brother is always watching you and the Thought Police can practically read your mind.” I recall there being much discussion of how horrible that would be and how it would never happen. Most law-abiding citizens have no difficulty with the concept that terrorists or criminals would have their information recorded. However, the law does not limit data collection to known criminals or terrorists, or even those under suspicion — it opens the door to collecting this information about everyone. Once collected, will the government be able to help itself in doing more with the data than intended? What is the difference then between the British government and that in China or Iran in modern times, or Nazi Germany and Communist Russia in more distant times? Will the government not face the risk of taking action because of some communications that when put together look alarming? How long will it take for the government to try to mine the data to find other “terrorists” or “criminals” who are so identified simply because they have similar surfing or communications patterns? Police have always wanted this kind of information, but society has said that individual freedom is more important. Just because it is (relatively) easy to get and keep such data now that it is electronic, does that make it right? It is almost impossible to get privacy back once it is lost … shouldn’t we ponder this a bit more before we risk the loss of privacy forever? Since that time, we have all gotten much more dependent on the search capability, and generally our searches are in Google. We watch YouTube videos assuming we are in the privacy of our own home. We use Google+ believing that we are communicating with our friends and colleagues. Further, we may not even be aware of the number of services we use that are all owned by Google. So, not only are we using the services more than we did in 2006, there are more of them that we are using. Even if none of them are associated with our names (and that is unlikely), it would be easy to identify many of us in the same way that the New York Times did in 2006. You might ask, “so what?” Well, as is often the case, I worry most about the teens and young adults who might search or behave in a way that might have long term implications for their lives and careers long before they have those careers. But, even for the rest of us, it is a concern. While Google claims to have the motto, “do no evil,” who knows what they will be in the future. Further, suppose that someone steals the information from Google and begins to be a disruptive force in people’s lives. Is it really so important for corporations to be able to target me specifically to purchase their products? Does marketing provide a compelling reason for me to lose my privacy? Even if those things were not an issue, many of us have different components to our lives that we do not want to confuse. When Google merges all of these different kinds of information, they will merge all of those selves. Let me explain with an example from Amazon. Amazon prides itself on being able to recommend relevant purchases based on your past buying history. When my son was a religious history major, I purchased books about a variety of religions. My husband likes to read history, and I often give him history books for holidays. I admit that I love mystery novels and do purchase them from Amazon. I also use Amazon to purchase wedding and baby gifts for friends and relatives, and other items as gifts. So, when I look at Amazon’s recommendations, I often find them amusing because they try to merge all of that information together into one profile and often miss the boat. This same “unified profile” idea is what Google is going to be selling, and maybe publicizing. This will make it difficult to keep a “professional image” and “personal image” that are separate. If you are not yet concerned, look at the information that Google has kept about you. If you have a Google account, login and direct your browser to https://www.google.com/history. You will then be looking at every search you have done since you got your Google account. There may not be any individual searches that are troubling, but what kind of image do you present when you look at them all together? These search data can reveal sensitive information about you, including facts about your location, interests, age, sexual orientation, religion, health concerns, and more. Is this information the business of anyone else?! The Electronic Frontier Foundation, an organization dedicated to protecting individual rights in the digital world, recommends that you remove your past search history before March 1, so that it is not included in the future profiles. If you have gone to your own history page, you can do this by selecting “remove all Web History.” A complete discussion is provided on the EFF site. In the future, you also need to remember not to login to Google before searching or viewing YouTube videos. This will keep them from linking your information to you. They will still keep the information about the use, and perhaps link it to your IP address, but at least it will not be linked to YOU. Further, you might consider using different search engines for different kinds of information. You can use Google for some searches, Bing for others, and Yahoo for still others. This makes it harder for any one of them to understand too much about you. You might even want to use anonymousing software, such as Tor or Anonymizer, to hide not only your name, but also the computer. 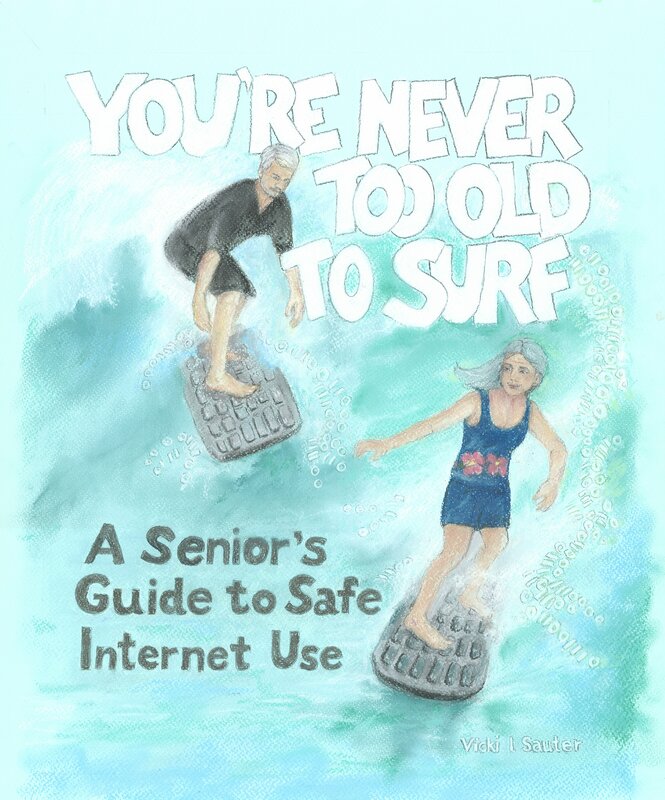 For more information about how to protect yourself while surfing, check out the Six Tips to Protect Your Search Privacy from EFF.